Need help setting up your miniMAX timer MULTI mode? Here, we will show you how to setup your miniMAX interval timer for a multi interval workout routine that has a warm up, followed by the actual workout and uses the "P" function. The "P" function is one of the features that makes the miniMAX unique from the Classic Gymboss, as it enables you to set up groups of intervals to be repeated in sequence within a workout program. Now that you know where the buttons are on your miniMAX interval timer, get yours out and follow along with the images and instructions below. In this example we will do a 4 minute warm up, followed by a tabata routine. This example is just to show you how to go through the setup process using the MULTI mode. 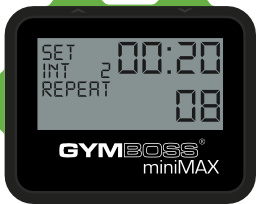 Always keep in mind the workout program you want to do and remember that you can setup your miniMAX to any time intervals you desire from 2 sec to 99 minutes. TO GET TO THE MENU - When you turn the timer on, it will always go to the mode you were using when you last used the timer. So the very first thing you need to do is get to the Menu. First, click the SET button, then use the Up and Down arrows to scroll to MENU. Click SET to choose. Then, use the UP and Down arrows to scroll to MULTI. Click SET to choose. Entering Setup - Press SET button to enter the menu. Use the Up and Down arrows to scroll to SETUP. Click the SET button to select and move on to start setting up the workout program. First Interval Setup - Our first interval is going to be the 4 minute warm up. Use the Up and Down arrows to change the interval to 4 min. Click the SET button to select and move on. Notice how the screen says SET INT 1 on it. The screen will always tell you what interval you are working on. First Interval Repeats - Now you need to choose how many times this interval will repeat. Use the Up and Down arrows to choose 1 repeat. Click the SET button to select and move on. Second Interval Setup - Now we will begin setting up the workout routine, in this case we will use the example of a tabata routine (20 sec on/10 sec off for 8 rounds) for it's simplicity. This interval will be set to 20 seconds using the UP and Down arrows. Notice how the previous interval is displayed on the top. Click the SET button to select and move on. 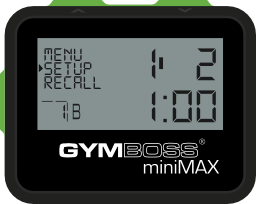 Second Interval Repeats - Set the number of repeats, in this case it will be set to 8 because tabata contains 8 rounds. Click the SET button to select and move on. Third Interval Setup - This is the next interval in the workout routine, in this case it is 10 sec. Use the Up and Down arrows to choose 10 sec. Click the SET button to select and move on. Again, notice how the previous interval is always displayed on the top. Third Interval Repeats - This interval is going to be set to “P”. "P" means this will repeat the previous interval (20 sec) and current interval (10 sec) in sequence as a group for the chosen number of repeats (8). This means the timer will do 20 sec, 10 sec, 20 sec, 10 sec. etc, etc 8 times in a row. Click the SET button to select "P" and move on. 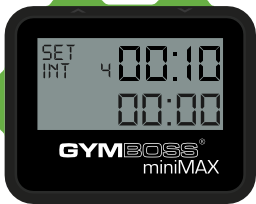 To Finish Entering Intervals - Set this interval to “00:00”. This will complete the intervals and indicate there are no more to enter. 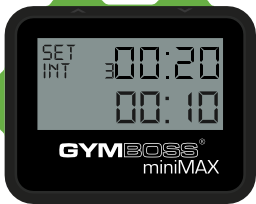 Setting an interval to "00:00" always indicates to the timer there are no more intervals to enter. (ALSO NOTE - If you wanted to include a cooldown interval, this is where you would enter it, then simply set the next interval to 00:00 to indicate there are no more intervals.) Click the SET button to select and move on. Set Number of Rounds for the Program - Set this number to 1 to run our program once. Click the SET button to select and move on. Set Alarm Type - Use the Up and Down buttons to choose either Beep high, beep low, Vibrate, or any combination. Click the SET button to select and move on. Set Alarm Duration - Use the Up and Down buttons to choose the alarm duration. Click the SET button to select and exit setup. If you have any questions after going over the setup above, we are always here to help. Just shoot us an email at sales@gymboss.com. This example is just to show you how to go through the setup process. Always keep in mind the workout program you want to do and remember that you can setup your miniMAX to any time intervals you desire from 2 sec to 99 minutes. Also, if you need more help the link below provides step by step miniMAX navigation and setup tips.